The LavaMC Mod made by haydenaa features elements added into Minecraft featuring lava. It includes lava tools, lava pickaxes, lava mobs, lava swords, custom biomes, custom blocks, and more. He is a new author and developer, and hopes to make many other popular mods. 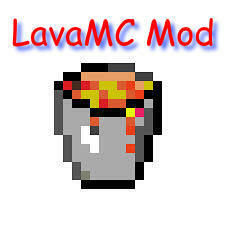 Please download the latest version of LavaMC here. This mod will only run with the Forge API. This mod has only been tested with 1.6.4 Minecraft Forge.